Breakfast. Again. Same as yesterday. And the day before. The Autodesk Community serves up answers to millions of customers. Over 27 million customers in the last 12 months have visited the community. Are you an Autodesk Community user? The Autodesk Community shares product-use information that solves potential product issues and promotes best practices to proactively supply customers with the tools and information needed for successful product experiences. Come and join us for an engaging session led by the customer experts known in the Autodesk Community as Expert Elites. 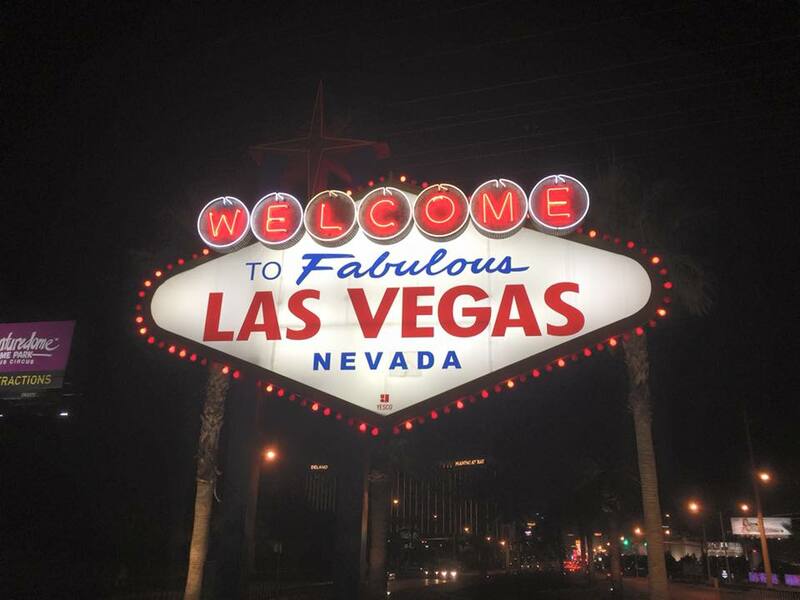 These customers will take you on a tour and share their insights to get the most out of the Autodesk Community forums. Course Objectives: Learn how to navigate the Autodesk Community in its many forms, Learn about setting up user accounts and preferences, Learn how to effectively ask and answer questions, Learn general rules and guidelines of behavior. The actual experience - An admirable job by four fellow Expert Elites and the Autodesk Staff that manage the forums. I think a little more rehearsal was probably in order, I always zone out if a presenter just reads from the slides being shown. What I got out of it - Expert Elites are passionate about the Autodesk forums and want as many users to use this free tool for support. Learning objectives: Learn how to use some of the most effective tips and tricks that are out there for instant productivity, Learn secrets about AutoCAD software that trump repetitive steps and tasks, Learn how to use fewer picks and clicks and get work done faster on any AutoCAD software platform, Learn how to go from a click slave to a click saver. The actual experience - So many good quality tips and tricks are offered in this course it's simply amazing. And they are all good, and totally relevant to the 2016 versions of AutoCAD/LT. What I got out of it - many tips I simply forgot about were highlighted: this time I wrote these down so I would not forget. When it becomes avaiable at AU for all users for free you should seek this one out and download the PDF of the handout. Objective: Kick-off the Autodesk Expert Elites Summit which will reconvene on Friday, December 4th. Autodesk's Amar Hanspal will be joining the Summit Kickoff as very special guests for an open Q&A discussion. The actual experience - Executive VP Hanspal introduced several future products that are about to be announced by Autodesk, and reaffirmed that the company is truly 100% focused on mobile and the cloud as the future of the company's software base. What I got out of it - I enjoyed the real-food lunch and the open honesty from EVP Hanspal about were Autodesk is focusing. The actual experience - This was a very well run class introducing the basics of Dynamic Blocks creation. The instructor covered in one hour what I could not find online as a training resource as a single document or class. What I got out of it - Quirks in some aspects of Dynamic Blocks creation and how to work around them was of real value. I will be blogging about these and other tips I picked up soon. Learn from the experiences of this panel of diverse CAD managers (R.K. McSwain, Robert Green, Kate Morrical, Curt Moreno) who are widely respected as leaders in their field. Hear their unique perspective and solutions to challenges faced by CAD managers from organizations of all sizes and backgrounds. Topics include understanding CAD standards, keeping up with rapidly changing technology, managing users, communicating with management and other non-technical people, budgeting, and much more. The actual experience - An honest discussion about Cad Management, Cad Managers and their bosses, and CAD drafting/production roles were reviewed by all four, each with their own take about each topic. What I got out of it - These four talented folks offered so many good ideas that I ended up Tweeting about them in rapid fire succession. Check them out HERE look for hashtag #ASK4AUExperts. Closing Keynote: Presented by Amar Hanspal, Sr. Vice President, Products. Like many kids growing up in India, Amar Hanspal’s parents wanted him to pursue what they considered a noble profession: doctor, politician, or even Bollywood star. But he believes there is a profession just as noble, that of the engineer. Join him as he celebrates the incredible work of the engineers and designers who solve today’s epic challenges of transportation, healthcare, education and access to clean water. Before you head off to the Closing Celebration, discover how you might use your skills to imagine, design and create a better world. The After Party Objective: Curious what the future looks like? Then don’t miss the Bash to the Future, AU’s final hurrah. You’ll be transported to another world where you can touch the stars, drink with aliens, and chat with robots. Enjoy games, music, cocktails, and a futuristic feast that’s out of this world. The actual experience - Way more fun that I anticipated. 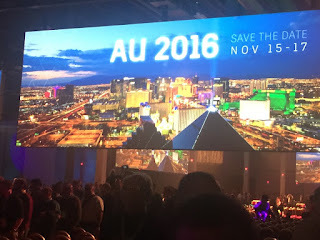 AU2016 was announced: Nov 15-17 of next year. FitBit Count for the day: 11,211 steps (5.17 miles). Breakfast. Again. Same as yesterday. Learning objectives: Learn tips and tricks from other AutoCAD users, Learn to use the newer tools for greater productivity, learn about hidden tips that might take you years to discover, Get exposed to tips that apply to many versions of AutoCAD ranging from 2012 to 2016. The actual experience - Jeanne Aarhus is a wonderful presenter/instructor and this is the second class in AU that I attended with her. She makes the class quite enjoyable, and even manages to make revealing tips I knew sound most interesting. Michael Mizuno - Senior Product Manager, Autodesk, Inc. This class will give you an overview of the future of AutoCAD® . The AutoCAD team will present new technologies, features, workflows, and tools that are designed to improve product knowledge, productivity, and efficiency of AutoCAD users across all industries. The actual experience - New features of a future AutoCAD version were revealed and they are amazing. Sadly I can't tell you as everyone in the class was required to sign an NDA agreement. What I got out of it - well, I can't tell you, but it's amazing. This is an opportunity for Autodesk to thank Autodesk Expert Elite unpaid volunteers for their continuous and valued contributions at the Autodesk public Product Support Forums. Want to know more about the Expert elites Program? Read all about it HERE. The actual experience - at our table the AutoCAD program director sat with five of us and was a very interesting man to talk with about the future, the past, and the current state of all the software under his umbrella. What I got out of it - that fuzzy feeling you get when you hang out with peers that are just amazing and the great Autodesk staff that support the program. Learning Objective: If you want a plethora of power-user tips, be sure join Cadalyst Columnist and Autodesk Technical Evangelist Lynn Allen as she takes you through a whirlwind of productivity techniques that are certain to improve your everyday drawing life. At a tip a minute, you’ll be sure to discover some top-secret AutoCAD software features that will remove tedium and boost your ability to meet project deadlines. She switches up the tips every year. The actual experience - Lynn is simply the most amazing presenter Autodesk has, and simply turned this talk into a joyful show to watch and participate in. What I got out of it - I learnt a tip I did not know: you can get a table to auto-populate and auto-number other cells easily by selecting two cells with numbers in sequence then selecting all the others below them. The actual experience - OMG, this was way over my head. Way over. What? Learning objectives: Learn how to create a completely fresh tool palette in a network location, Learn how to create, edit, and save tools onto your networked palettes, Learn how to boost productivity with scripts and macros hosted on your palettes, Learn how to hack your tool palettes without opening AutoCAD. The actual experience - my fellow EE Paul Munford is an amazing presenter and showed us how he likes to manage, share and develop/innovate with Palettes to control office standards. What I got out of it - I learnt about a tip: resorting the content of a palette by selecting all, CTRL+X to cut to the clipboard, then CTRL+V to paste. Objective (yes I am a memeber of AUGI, are you? ): This session features the year in review and a look ahead for members of Autodesk User Group International (AUGI). Open to AUGI members and non-members alike, this session culminates in the presentation of the AUGI Wish List - the 10 top product improvement wishes for key Autodesk products. Attendees will hear about AUGI's accomplishments in 2015 and get a sneak peek of the organization's plans for the coming year. And there's a chance to win awesome prizes and Premier and Professional memberships. And of course, everybody leaves with an AUGI Beer mug for the annual AUGI Reception which follows immediately. The actual experience - Continuing more modestly with the Star Wars theme, the AUGI president and other board members presented AUGI to those that don't know about this user organization, and with some fanfare presented Autodesk with the latest list of use wishlists for AutoCAD. What I got out of it - a free beer glass. Objective (yes, I am a member, are you? ): Join thousands of members of AUGI (Autodesk User Group International)—the largest Autodesk community—whose motto is “Users Helping Users.” At this reception, you’ll enjoy making connections, comparing notes, and checking out the latest technology exhibits and activities over a cold beer. Open to everyone, not just AUGI members. Objective: The Autodesk University Blogger Social started ~12 years ago and morphed into a more formal AU Blogger and Social Media Meetup event is now in it’s 8th year will be held jointly with the Autodesk PR, Social Media Team, and Office of the CTO to show our appreciation for active bloggers and influential social media who cover Autodesk products and customers. In past years in addition to beverages and good conversation and networking we have had surprises such as having a Zero G 3D printer to be used in space from Made in Space and the Megabot team and I am working on some surprises this year as well. We might also get a few special VIP seats like we did last year to give away for the closing keynote. The actual experience - a fun meet and greet experience were I got to meet some of the best bloggers out there. FitBit Count for the day: 9,248 steps (4.22 miles). So how do you feed +/-10,000 attendees? in a very big hall. From 6:30-8:00, I joined the others for what is a very basic hotel breakfast that is there to kick start your day. Learning objectives: Learn to capitalize on AutoCAD knowledge to help others learn in a whole new way, Extend the knowledge of AutoCAD software’s capabilities. The actual experience - This was as much fun as I hoped it would be. Set up like the game show Jeopardy, a very long list of quick fire questions and answers were needed for a very comprehensive list of AutoCAD commands, features, variables and functions that the whole class participated in. And there were prizes for correct answers too. What I got out of it - I actually learned two things that never occurred to me before: "nudge" command works with SNAP distances, plus a good example of when SPACESWITCH command might come in handy. 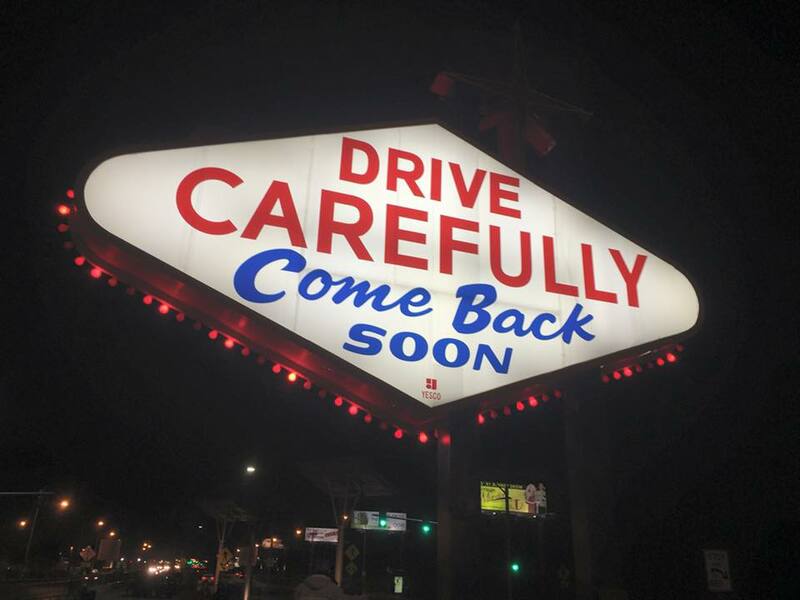 Join Autodesk CEO Carl Bass and CTO Jeff Kowalski as we kick off Autodesk University 2015. The actual experience - Wow! sensory overload. What I got out of it - It was fun to attend. The actual experience - food stations located between exhibitors at the exhibit hall. What I got out of it - lunch and staring at exhibits. The actual experience - This was an excellent class that offered very detailed instructions and guidelines for file recover methods, ways to try and avoid file corruption, and so much more. What I got out of it - The methods I already use are still valid, but I was exposed to a better systematic approach that I will use in teh future. Learning objectives: Learn how to create attributes and redefine existing attributes, insert fields, insert field with text/mtext, or use with attributes, Learn to use fields for complex calculation using elements property combining with formulas, Learn how to extract attribute/fields from the design data and output as AutoCAD Table or export as Excel or database file. The actual experience - With AutoCAD loaded on computers for all of us class attendees to use, the instructor's intent was to present a hands on experience in creating attributes, fields, and links to external Excel files and Tables inside AutoCAD. Sadly he was ill prepared, seemed challenged by his own material and overall did little to provide anything warranting an "intermediate-advanced" class. What I got out of it - Not much. Can I get a refund? Learning objectives: Discover core concepts for AutoCAD dimensioning, new dimension tools in AutoCAD 2016, use all options within the new dimension tools, and Learn how to identify the best ways to edit existing dimensions. The actual experience - This happened to take place in the exact same room as the class I attended before, but with a much better experience. The instructor had three test DWG files ready on each computer, walk us through the new DIM command features in AutoCAD 2016, and was very engaging and was not afraid to answer difficult questions. What I got out of it - While I did not discover any new features I did not know about, I did learn how to fix a glaring AutoCAD 2016 problem when using Annotative Dimensions and Baseline Dimensions. Now I can go back to drawing these again. What's that fix? I'll blog about it later this month. Objectives: lasses end the party begins. Join everyone in the Exhibit Hall for the AU Community Reception as they close out day 1 of AU. Take in a bite, a sip, a boogie, and lots of networking with thousands of like-minded professionals from around the world. Chat with AU exhibitors and see the latest technologies at work in the world. The actual experience - food, networking, hanging out with exhibitors, and overall just a great way to wind down after a long and busy day. FitBit Count for the day: 14,249 steps (6.52 miles).